Finish This… #23: Compliments, red lips, investments, and memories. Okay, here goes Week 23. …was the day one of the smartest people I’ve ever met told me he though I was one of the smartest people he’d ever met. That was pretty amazing, actually. …SO super blonde. I could never pull off red lipstick until I was this blonde. …summer vacations in LBI, winters spent riding sleds down the hill in our backyard, man hunt with the neighborhood kids, climbing trees with Kristy, and Christmas Eves with all my cousins at my grandparents’ house. Also, we have something super special planned for Week 25, so check back for that! Finish This… #7: buying, stars, courage, and swimsuit shopping. Yup, still a slacker. Squeezing this puppy in with just a few hours left in the day. A more devoted blogger would have gotten this done last night and scheduled it to post a 4am this morning. I have no excuse. Well, actually I have three. Work. Headache. I really wanted to finish the book I was reading. 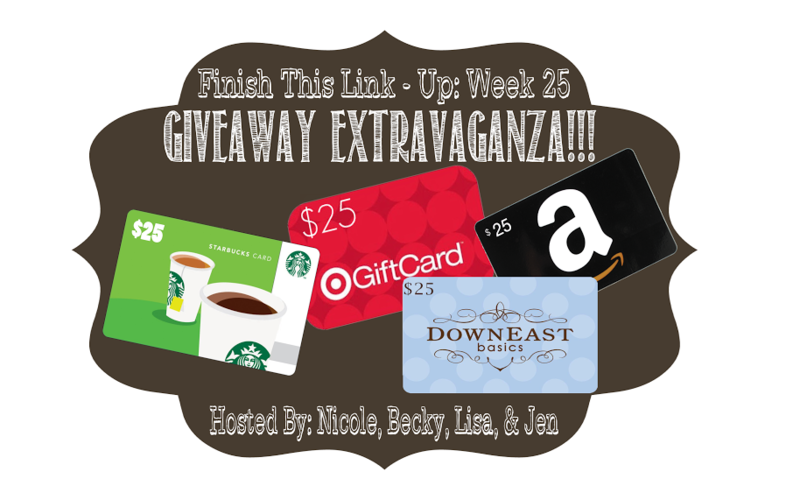 As you likely know by now, this is a weekly link-up hosted by Nicole (Three 31), Jen (The Arizona Russums), Becky (The Java Mama), and I. If you’re a blogger, join in! Check the link-up link below to add your post and read other bloggers’ Finish This… posts. Okay, here goes Week 7. …a pair of trail shoes to wear when I go to Hawaii in April. Got any recommendations? 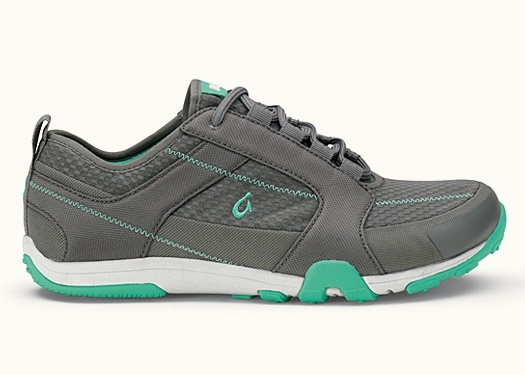 So far I’ve ordered these Olukai sneakers so far. I suspect they won’t look very attractive on me, and I’m sure I’ll order several more pairs before I find a winner. …True Romance! I finally saw this movie for the first time on Friday night, and I loved it so much! I was also lucky enough to see it on the big screen at the Naro theater in Norfolk, which was an added bonus. Loved the characters, loved the story, loved the soundtrack, loved the leopard print, and especially loved the sunglasses. …I nominated myself to manage my company’s Salesforce.com CRM implementation. It’s a big project, and it’s why I’ve been so busy, but it’s totally worth it, and it’s going to completely change the way we do business. Things are only going to get more hectic, but I’m enjoying the challenge. Link-up your Finish This… post and browse other posts HERE! Finish This… #5 AND #6: because I missed a week. I’m a slacker, and I missed last week. Well, actually I missed it because I’m the complete opposite of a slacker, and I’ve been spending most of my time working. I know that sounds boring, but it actually isn’t. Now that I have a really awesome job, I don’t mind working hard or working a lot. I’ve got the perfect opportunity to learn and accomplish so many amazing things this year, so I’ve made my career one of my main priorities for 2014. But for now, I’m taking a little break to get caught up on my Finish This… posts. As you likely know by now, this is a weekly link-up hosted by Nicole (Three 31), Jen (The Arizona Russums), Becky (The Java Mama), and I. Okay, here goes Week 5. …my ridiculously long list of childhood hobbies. Of course, I can’t spend lots of time on all of them at once, but at different points, I always go back and revisit my favorites — especially horseback riding, ice skating, dancing, and music. …pretty much whatever I want within reason. I’m 32. I’m legally single. I work hard. I save a lot of my money. And so I don’t mind treating myself to the things I want here and there. I mostly splurge on salon and spa appointments, clothes and shoes, wine and liquor, food, vacations, and occasionally having someone come clean my house or detail my car. …being late. Or maybe eating too many carbs. One of those two, for sure. …my ability to flee the country at any time. And the comfort of knowing I have a second form of ID if I ever lose my license? …that I’m going to be kidnapped if I go out running alone in the dark. Or that I’m going to randomly die in the middle of the night, but since I live alone, no one will even notice for a few days. Both of those are ridiculous. And I hate bugs. …advice and explanations. I think I’m pretty decent at both, and I’m always willing to listen to someone’s issue — whether it be personal or work-related or whatever — and give a little guidance about how to handle any kind of situation. I think it’s because I like solving problems. …not celebrating Valentine’s Day. I mean, usually I hang out with my boyfriend, but I don’t really pay any attention at all to the fact that it’s Valentine’s Day. I almost always ask him not to give me anything, but he usually does anyway. Which is nice, but it’s nice just because he’s nice. Not because it’s Valentine’s Day. Friday we are going to go see True Romance at the Naro. But only because it’s Friday and a cool movie from 1993 is playing in a movie theater. Not because it’s Valentine’s Day. …caffeine. No, seriously. Ever since I gave up caffeine, if I have any at all, I get all shaky and my heart starts racing. It’s stupid. Don’t look for it. Let it come to you. And if it doesn’t stick around too long, just let it go, and wait for something better. I’m still going to have to go with the old Lisa/Mikey Q love story. It was long and a little bit out of control, but so full of fun, craziness, good music, unique experiences, impeccably written letters, surprises at every turn, and everything I really ever needed to learn about being in a relationship with pretty much anyone. And even though it didn’t end the way we once thought it would, I’m glad that we’re friends now and always will be.